Photo of the Hallbjarnarstadaá Creek. Showing fossilized shell banks. At Simrad, Horten, Norway. Iconic native copper specimens and apple-green prehnite specimens were found during construction of this industrial site in the beginning of the 1980s. Today the locality is built over and lost. But remnants of the outcropping basaltic lava is still to be seen behind the building. Photo taken the 3. mai ‎2005. 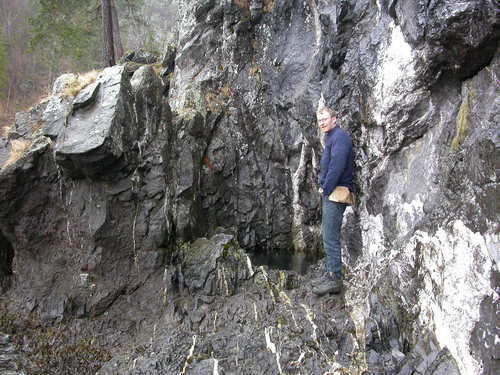 The Norwegian mineral collector Stig Larsen inside the small Cu prospect at Kirkebukta, Løvøya, Horten, Vestfold, Norway. Native copper crystals and chalcocite group minerals are found in hydrotermal, tectonic calcite veins in Permian basaltic lava. Copper was first discovered at Løvøya around 1720. Photo taken the 6. ‎april ‎2004. 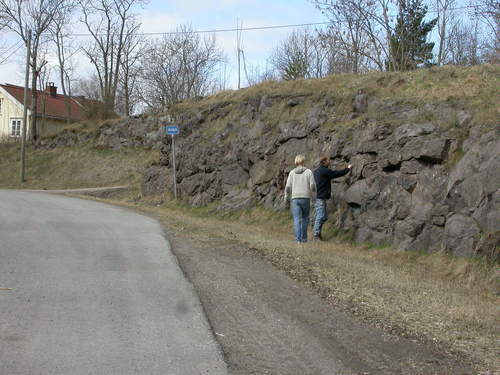 A roadcut along RV 310 (Falkenstensveien) at Kotterød, Borre, Horten, Vestfold, Norway. 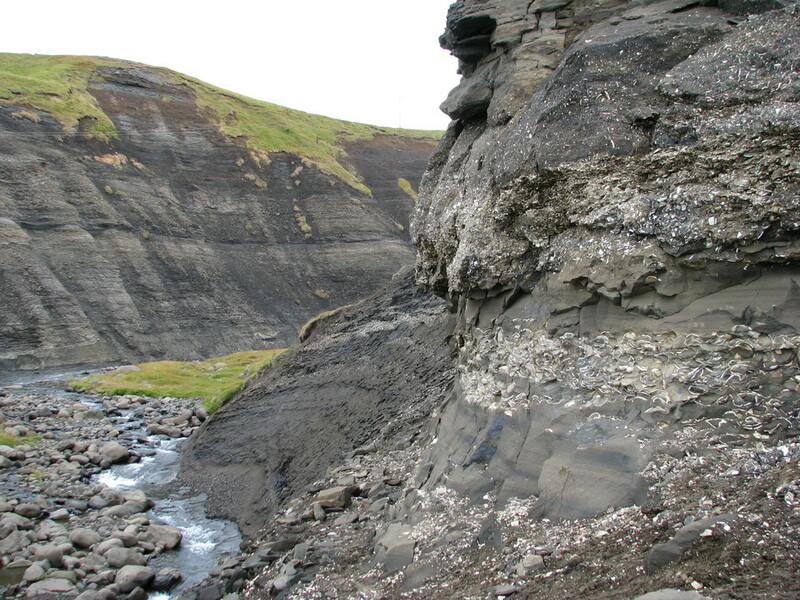 A small number of mineralized amygdales in basaltic rock were exposed during the expansion of the road in the 1980s. Members of the Vestfold Geologiforening (Vestfold Geology Society) Stig Larsen and Ken Roger are inspecting the remnants. 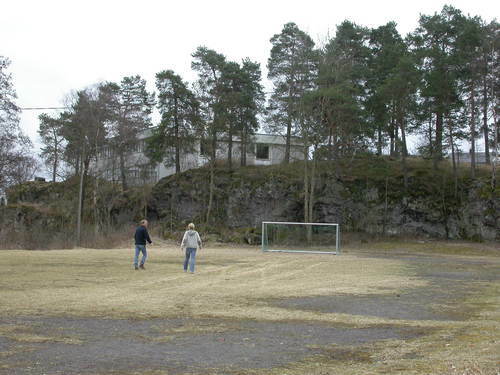 A Permian basaltic lava (B1-sequence) is outcropping at Bekkajordet, Horten, Vestfold, Norway. 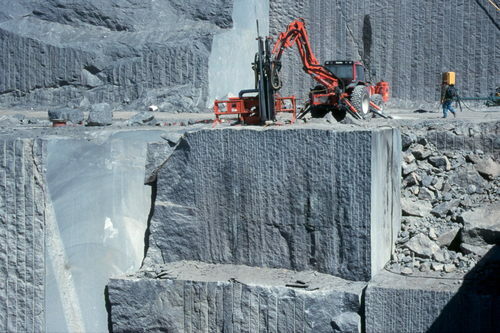 From a common scene in the Vevja 2 larvikite quarry, large block of larvikite is sawn out from the quarry wall. Photo scanned from a color slide. Barylite from Bratthagen, Hedrum, Larvik, Vestfold, Norway. The crystal is laying on (100). The arrow points to a trace of the cleavage (011) of barylite. Barylite is one of the rarest minerals found at this localiy, this is the only published photo of a verified barylite from this locality. Fig 2. in Sæbø, P.C. 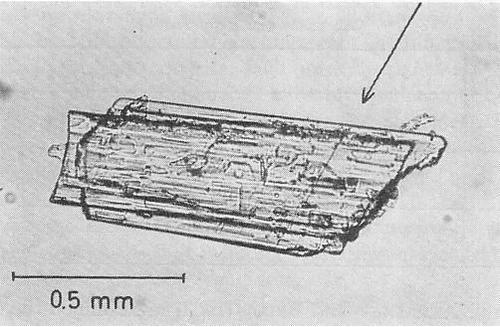 (1966) Contribution to the mineralogy of Norway no. 35. 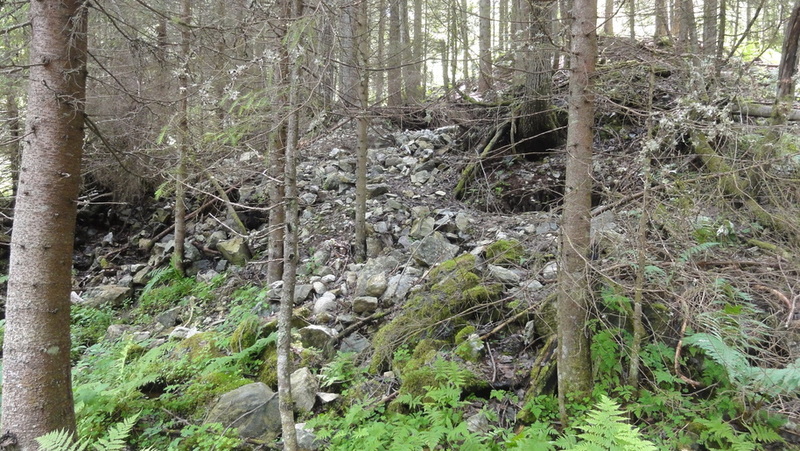 The first occurrence of the rare mineral barylite, Be2BaSi2O7, in Norway. 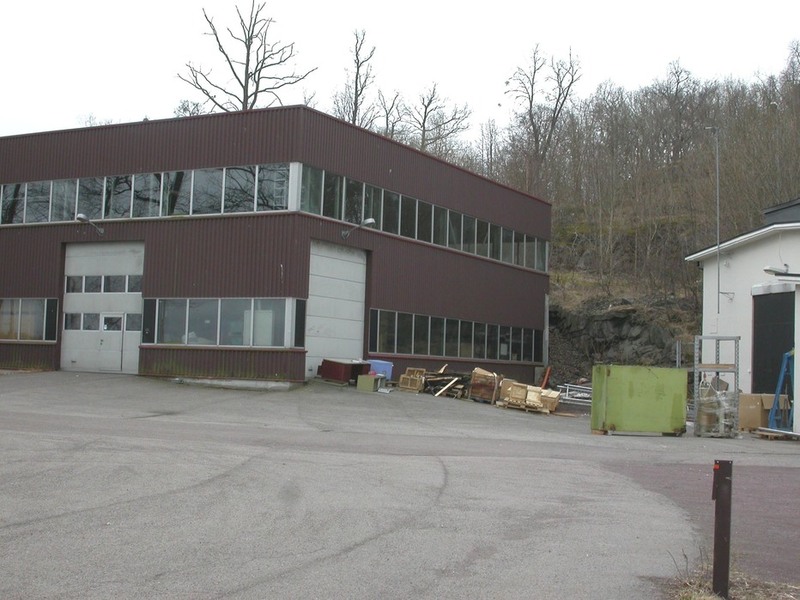 Norsk Geologisk Tidsskrift, 46: 335-348. One of the dumps at the Overntjern quarry. A serpentine-magnesite outcrop was quarried for magnesite and serpentine here. 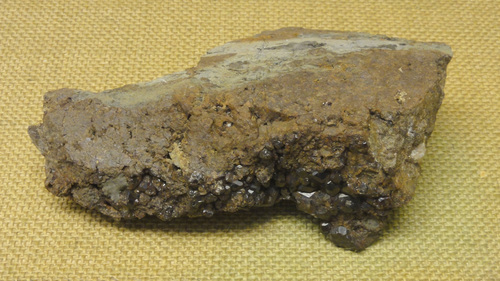 One of very few specimens with brownish vesuvianite that have been found at Styggås, Ødegårdsbukta, Brunlanes, Larvik, Norway. Specimen of special interest for the topographical mineralogy of Vestfold. The area is now a protected Nature Reserve and collecting is not allowed. Photographed trough glass. Exhibited in the Bergen Museum, Bergen, Norway. (Permanent mineral exhibition). 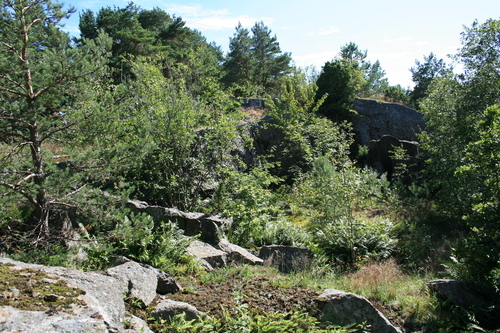 The abandoned larvikite quarry at Påskeberget, Viksfjord, Tjølling, Larvik, Vestfold, Norway. It's mostly overgrown. No traces of any syenite pegmatite dikes were found in the old quarry at the visit ‎11. ‎august ‎2007.